Five people have died since a wildfire that broke out Monday in Northern California jumped the Sacramento River Thursday and headed toward the city of Redding. A mother confirmed her missing grandmother and her two children dead in the wildfire in Shasta County, named the Carr Fire, Saturday. Melody Bledsoe, 70, and her two great-grandchildren, James Roberts, 4 and Emily Roberts, 5, had been missing since Thursday, when the Carr Fire blazed through outskirts of Redding. A fire inspector and a privately hired bulldozer operator, whose name was not identified, died fending off the fire Thursday. [post_ads]The fire inspector has been identified as Jeremy Stoke, Redding Firefighters' union announced. "We ask for your thoughts and prayers for his family and the RFD as we process this tragic loss," the union posted on Twitter. 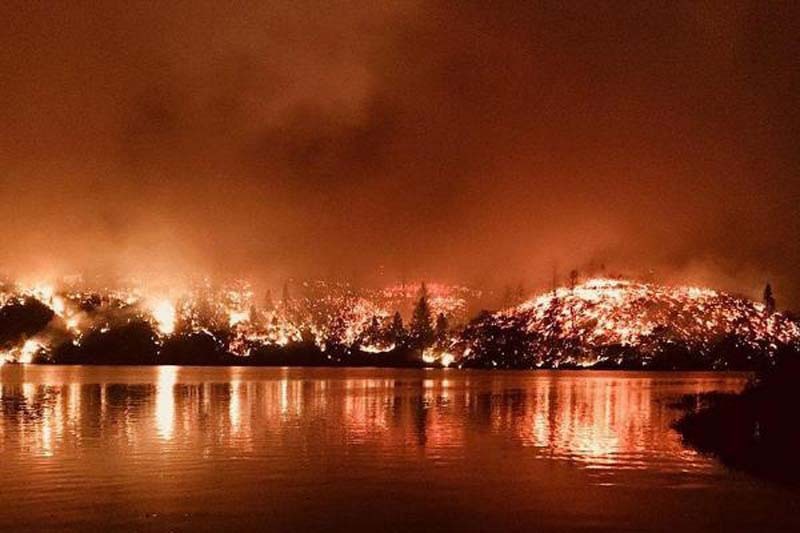 The wildfire threatened thousands of homes in Redding, California, Saturday after nearly doubling in size the night before. It has been driven by winds, dry vegetation and high temperatures and has now burned through 80,906 acres with 5 percent contained, Cal Fire said. President Donald Trump on Saturday issued an emergency declaration in California and ordered federal assistance to supplement state, tribal and local response efforts in dealing with the wildfires. The fire ignited Monday after the mechanical failure of a vehicle, according to Cal Fire. Three Marin County Fire Department firefighters were also injured in the Carr Fire in Shasta County and were treated at Mercy Hospital in Redding. "All three have been evaluated for burns to ears, face, and hands and have been released from the hospital," a statement posted on the department's Twitter account said said, though one firefighter was receiving more evaluation Friday at UC Davis Burn Center. The three firefighters injured while they were assigned to structure defense from "a sudden blast of heat" near where they were assigned, according to department's statement Friday, have been identified as Engineer Scott Pederson, 37, Tyler Barnes, 34, and Brian Cardoza, 26. "At this time we are focusing on the health of our firefighter's and ensuring peer support is in place for the members of the strike team," Chief Jason Weber said. "Our thoughts and prayers go out to the families of the two firefighters that lost their lives yesterday battling the same fire." Firefighters have dealt with "extreme fire behavior" while battling the blaze including a firenado--a fire tornado--swirling flames across a road. The tornado damage caused damage on the roads and uprooted trees. The fire has also destroyed 500 structures and damaged 75 other structures, Cal Fire said. Nearly 5,000 more structures are threatened. Authorities have ordered many evacuations due to the fire in Northern California. Another fire, called the Ferguson Fire, around Yosemite National Park in central California has burned through 49,618 acres with 29 percent contained, as of Saturday. The hot, dry weather out West has also grown other fires in California area, Oregon, and Idaho.